The Genuine Old School Shaving Kit: This shaving set arrives in a craft case with the original Gentleman's Hangar mustache printed on the front cover making this the ideally packaged gift for Father's Day, groomsman, or a birthday. 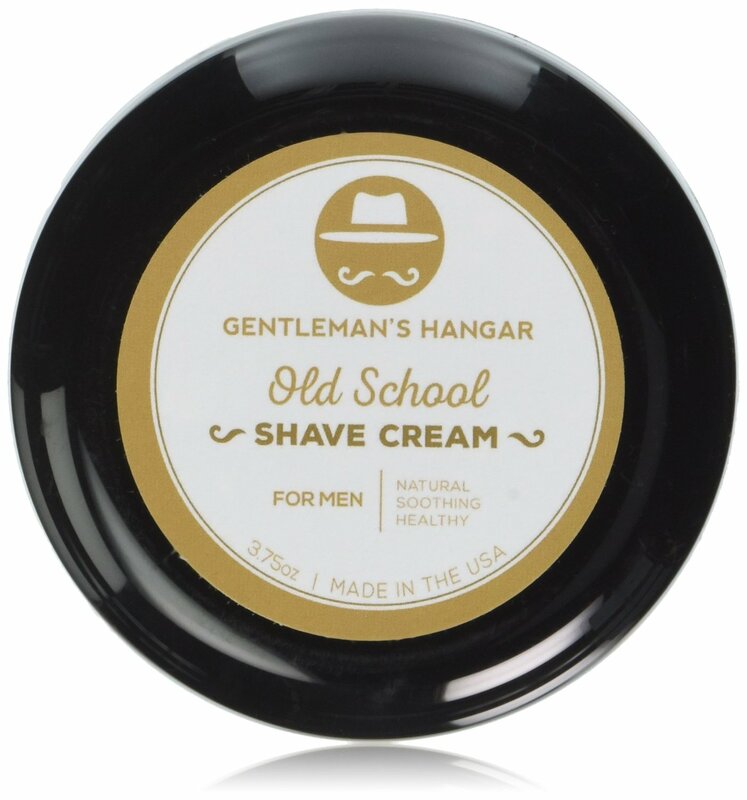 Gentleman's Hangar Pre-Shave Oil (2 oz. 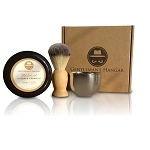 bottle): Start your shaving regiment the right way, with Pre-Shave Oil from Gentleman's Hangar. Our pre-shave oil penetrates the skin to lock in moisture to create a nick and irritation-free shaving experience that will leave you feeling refreshed. Genuine Old School Shaving Cream (3.75 oz. ): Enjoy the traditional shave experience with our top-rated shaving cream. Only a small dab of cream is needed to cover your entire face and neck. Lathers easy and moisturizes skin as you shave. Our cream features a light sandalwood scent and is made with natural ingredients like organic aloe leaf juice, green tea extracts and vitamin D that won't irritate the most sensitive of skin. Old School Sandalwood Shave Cream is Paraben-free, never tested on animals, and made in the USA. 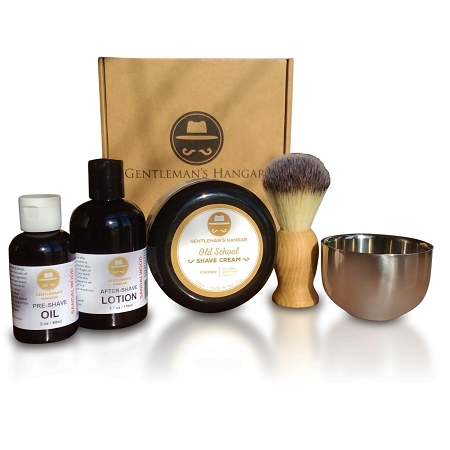 Authentic Wood-Handled Brush and Stainless Shave Bowl: To truly recreate the throw-back shaving experience, you'll want to take advantage of the wood-handled shave brush and stainless steel bowl included in this package. 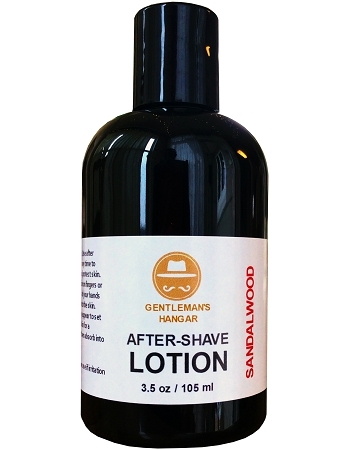 Sandalwood After-Shave Lotion (3.5 oz): Finish off the experience with our Sandalwood After-Shave Lotion, which cleans your pores and moisturizes skin. It's a perfect ending to the old school experience. Pre-Shave Oil: Vitis Vinifera (Grape) Seed Oil, Olea Europaea (Organic Olive) Oil, Sandalwood Oil, Limnanthes Alba (Meadowfoam) Seed Oil, Tocopherol (Vitamin E), Triticum Vulgare (Wheat Germ) Oil, Vaccinium Macrocarpon (Cranberry) Fruit Oil, Rudus Idaeus (Red Raspberry) Seed Oil, Rosmarinus Officinalis (Rosemary) Leaf Extract, Azadirachta Indica (Neem) Seed Oil, (May contain sodium bicarbonate and/or citric acid as pH adjusters). Shave Cream: Water, potassium myristate, potassium stearate, sodium myristate, sodium stearate, glycerin, carthamus tinctorius (hybrid safflower) seed oil, sandalwood essential oil & fragrance, aloe barbadensis leaf juice*, betaglucan, symphytum officinale (comfrey), calendula officinalis, camellia oleifera (green tea) hydrastis Canadensis (golden seal) root extracts; tocopheryl (vitamin E) acetate, cholecalciferol (vitamin D), retinyl (vitamin A) palmitate, zea mays (corn) oil, hydroxyethylcellulose, sorbic acid. *Certified organic ingredient. After-Shave Lotion: Aloe Barbadensis (Organic Aloe) Leaf Juice, Cocos Nucifera (Organic Coconut) Oil, Emulsifying Wax NF, Glycerin, Hamamelis Virginiana (Witch Hazel) Water, Phenoxyethanol, Stearic Acid, Tocopherol (Vitamin E), Simmondsia Chinensis (Organic Jojoba) Seed Oil, Organic Alcohol Extract of Salix Alba (Organic White Willow) Bark, Rosmarinus Officinalis (Rosemary) Leaf Extract, Azadirachta Indica (Organic Neem) Seed Oil, Lecithin, Xanthan Gum, Alcohol, Tetrasodium EDTA, Essential Oil. (May contain sodium bicarbonate and/or citric acid as pH adjusters). it for my boyfriend and he said they smell good. Bought it for my boyfriend and he said they smell good. My husband really liked the old fashioned shaving experience. The scent is amazing. I love it too. However, he has very sensitive skin and he''s concerned the scent is going to cause a problem if he uses it regularly. If this is not a problem for you, then it''s a good choice. This product was truly amazing. The pre shave oil lathers in nicely and has a great scent, makes the hair become less tense. The shaving cream also has an amazing scent, love the smell. 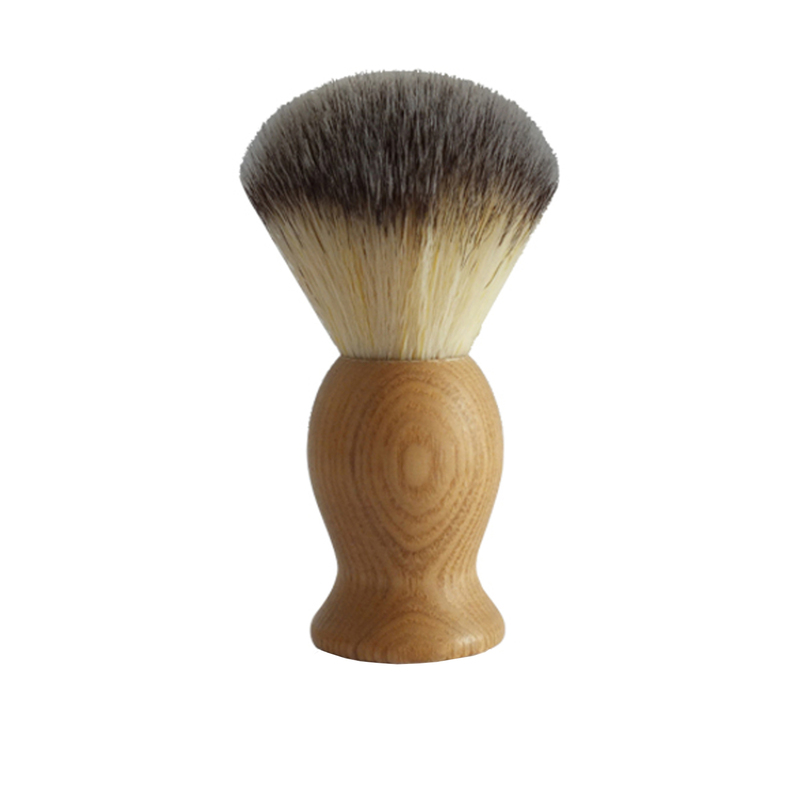 The brush is extremely soft and once combined with the shaving cream it feels extremely smooth when brushing along your face. Overall amazing product, great quality, and smell. It has allowed me to enjoy shaving once again. Great Shaving Kit - The Perfect Gift! I was given this product as a gift from a friend. It was a great gift! 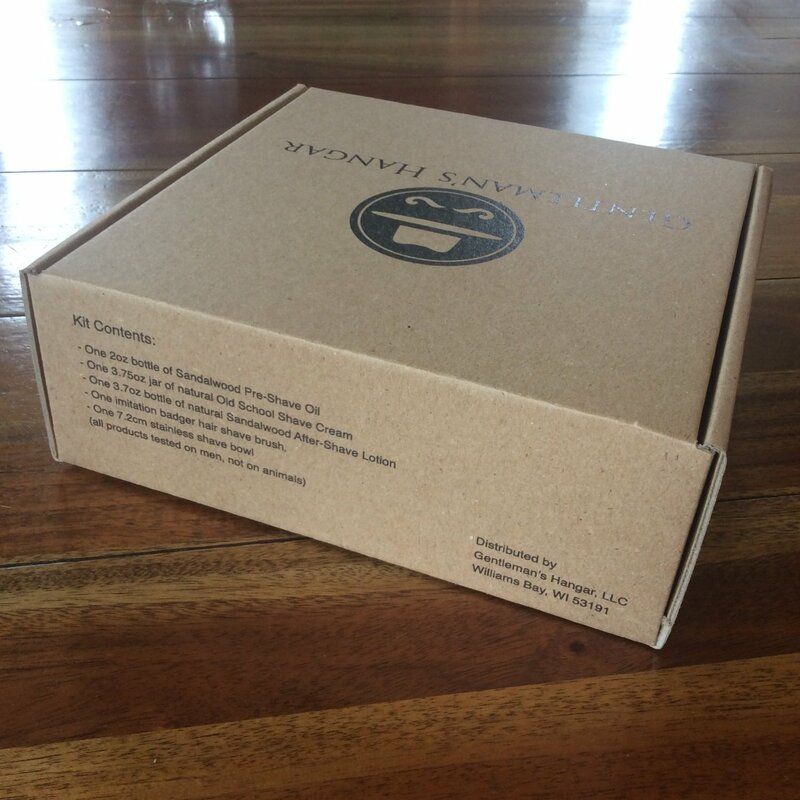 I was very impressed with the high quality products within the shaving kit. My favorite part was the pre-shave oil which really helped me achieve a super close shave. The whole process was extremely fun and really made my shave experience perfect. My wive loves the smell of the after shave lotion which is an added bonus. Great product from Gentleman''s Hangar, two thumbs up!